Leading repair, servicing and maintenance engineers, and technical support company for Aberdeenshire's biomass systems and plantrooms. We make it possible for commercial and industrial biomass heat and power system owners in Aberdeenshire and throughout the UK to maximise their income from RHI, increase the lifetime of their biomass heating system and minimise breakdown incidents. We help Aberdeenshire's biomass owners in three ways: 1. one off biomass repairs, 2. ongoing servicing and maintenance contracts and 3. RHI protection insurance. If you are based in Aberdeenshire and you have a biomass boiler breakdown, we can provide immediate technical support over the phone and, if needed, arrange for a visit from one of our highly trained biomass service engineers in the Aberdeenshire area. 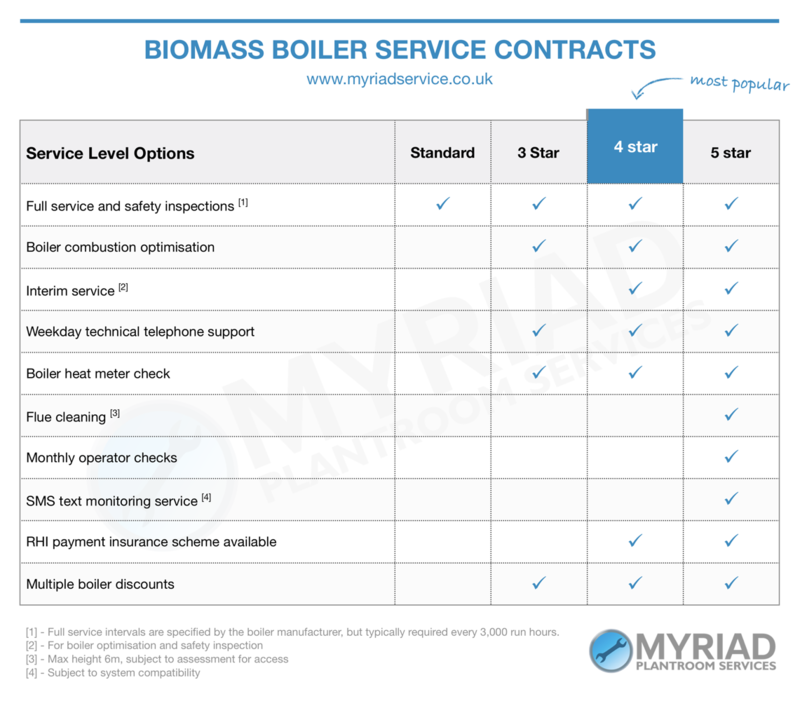 If you would like ongoing support, maintenance and servicing for your boiler in Aberdeenshire, you could benefit from one of our biomass service packages which are detailed in the table below. We have five servicing and maintenance plans for Aberdeenshire based customers. Please note that the details below are indicative. Our quotes are tailored to your exact requirements, taking into account complexity and quantity of biomass and plant room equipment, support and maintenance responsiveness and intensity requirement and exact boiler/plantroom locations in and around Aberdeenshire. Cost reduction - We have extensive experience in the optimisation of biomass boiler performance, helping businesses in Aberdeenshire save up to 35% on their biomass running costs. You can also join our other customers in Aberdeenshire who enjoy generous percentage discounts on spare parts and labour under our tiered service plans. RHI payments - We help our clients in Aberdeenshire and across the UK to meet all of OFGEM’s RHI service eligibility requirements to successfully claim RHI. Reliability - Prevent boiler and system issues through remote monitoring (identifying and solving problems before they materialise into breakdowns) and planned preventative maintenance (with planned site visits to boiler and plant room sites in the Aberdeenshire area. Longevity - Ensures Aberdeenshire's biomass-based heat and power systems run efficiently for longer by using only approved, genuine parts fitted by accredited heating specialists in the Aberdeenshire area. Priority Scheduling - Guarantees a convenient pre-holed service visit to your plant room in the Aberdeenshire area and gives you priority access to labour in the event of a breakdown occurrence. Technical Phone Support - Before we even dispatch a local Aberdeenshire service engineer, you will receive quick access to expert technical biomass support over the phone, from one of our experienced central biomass specialists to resolve your system's issues.